London: Printed for B. Law, et al. 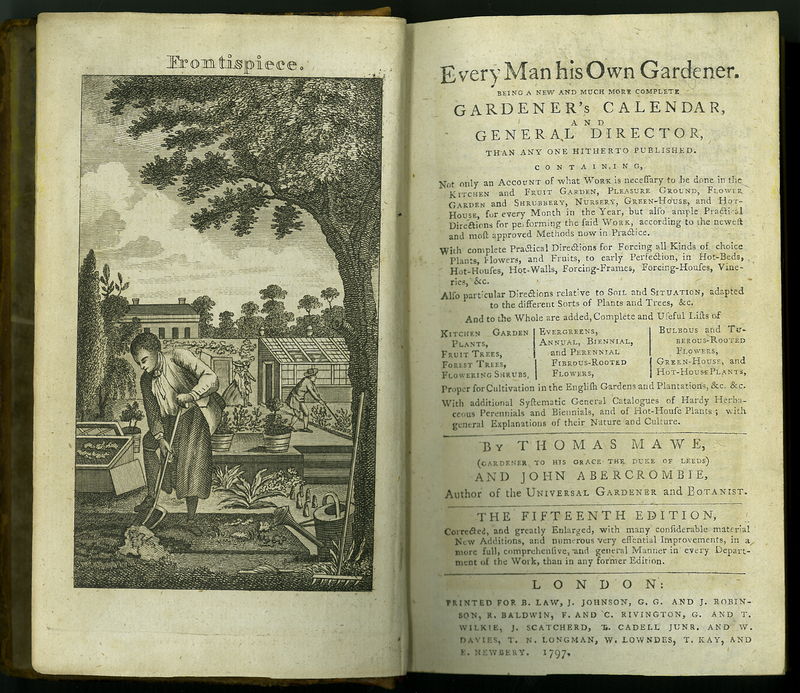 Every Man his Own Gardener was first published in 1767. Over the next 100 years and 21 editions, it would become one of the most important gardening books of the time. The frontispiece for the first edition was drawn and engraved by eminent English engraver, Isaac Taylor (1730-1807). Taylor’s image, or a reworking of it, was used as the frontispiece for the first fifteen editions. However, from the sixteenth edition onwards, the frontispiece was changed, and it depicted the author, John Abercrombie (1726-1807), Scottish gardener and horticulturalist. Thomas Mawe, gardener to the Duke of Leeds, lent his name as author of the book to increase the book’s saleability and was paid £20 for his trouble. Thomas Mawe and John Abercrombie, “Every Man His Own Gardener. Fifteenth edition,” ourheritage.ac.nz | OUR Heritage, accessed April 24, 2019, http://ourheritage.ac.nz/items/show/10688.